Nope, we’re not even kidding you right now. There's a 12-metre long and six-metre wide suspended crystal installation will literally be hanging around across the ditch in Sydney for an entire three months. It’ll be made from said crystals, beads and a whole lot of sparkly bric-brac. You can actually walk through the clouds of crystal too—ladders allow you to ascend to the top of the work and peer down into it. 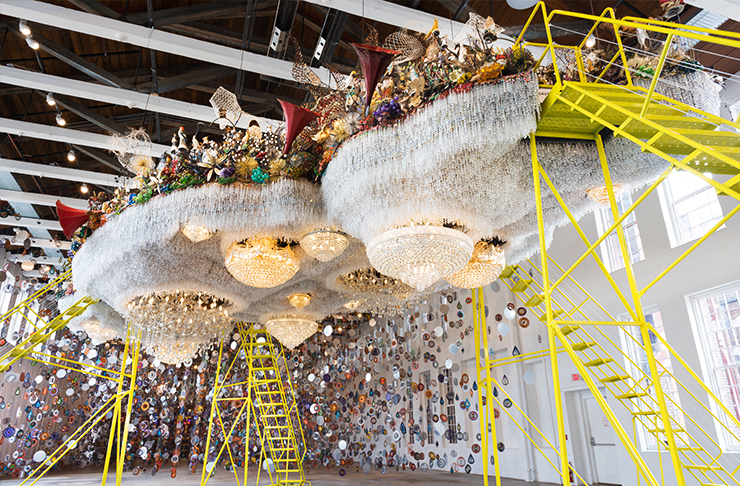 It’s pretty much the largest-scale piece of awesomeness artist Nick Cave has ever done so we’re hella thrilled it’ll be open for business Down Under but to top it all of, there’s actually a heap more for you to see. The actual commissioned exhibition is titled UNTIL and you’ll also find Hy-Dyve, an immersive 14 channel video installation, Flow/Blow, a fan propelled wall of shimmering mylar filament, and the Beaded Cliff Wall, an extraordinary mountainous installation constructed with millions of plastic hair pony beads. This immersive exhibition topples with issues of race relations, gender politics and gun violence in America, and the resonance of these matters in communities around the world so with the magnitude and Insta-worthiness of this of this work set aside, it’s absolutely a must-see. For more deets on everything you can see, head here.